A very happy Monday to you! Yes, you, the one who is suffering from Monday blues after a fantastic weekend of having fun doing whatever you do for fun. I know, I know. How can Mondays ever be happy? Mondays mean getting up early for work, or to make school lunches for the kids (which will always come back uneaten so what’s the point of life anyway? ), or to do boring errands such as paying bills and grocery. 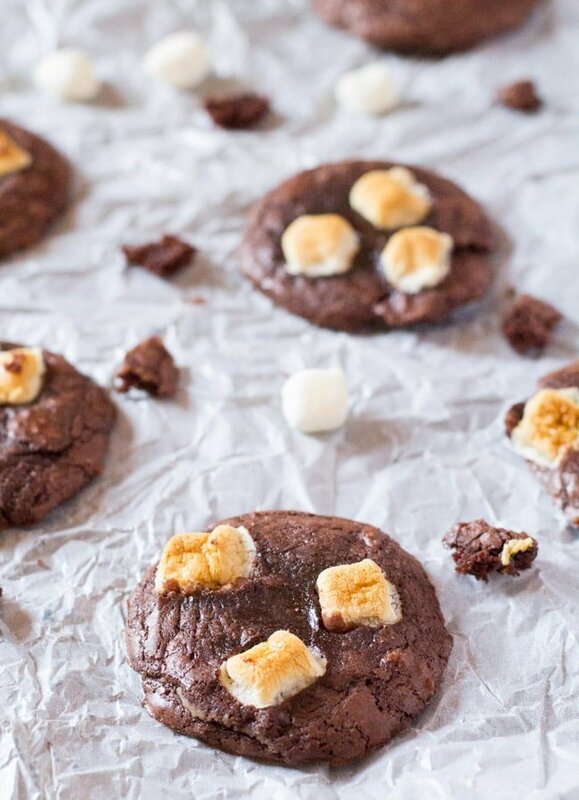 But don’t you worry, I’m here with these Brownie Mix Cookies topped with mini marshmallows to make your Monday a bit better. Not perfect, mind you, because how can Mondays ever be perfect? But cookies do make everything better don’t they? And so do brownies, now that I come to think of. 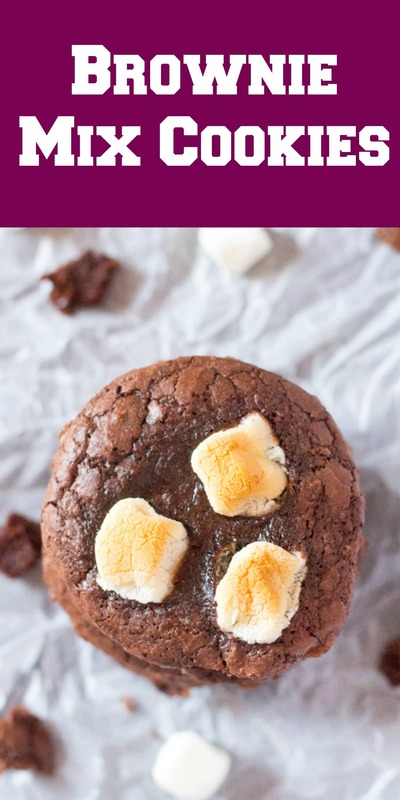 These Brownie Mix Cookies are perfectly chewy with their shiny crackly tops and taste just like brownies, but are more chewy. And of course, the mini marshmallows are the shining glory of these cookies. I was initially just going to leave the tops plain, but then I saw the mini marshmallows in my baking pantry, and a lightbulb clicked in my dessert loving brain. 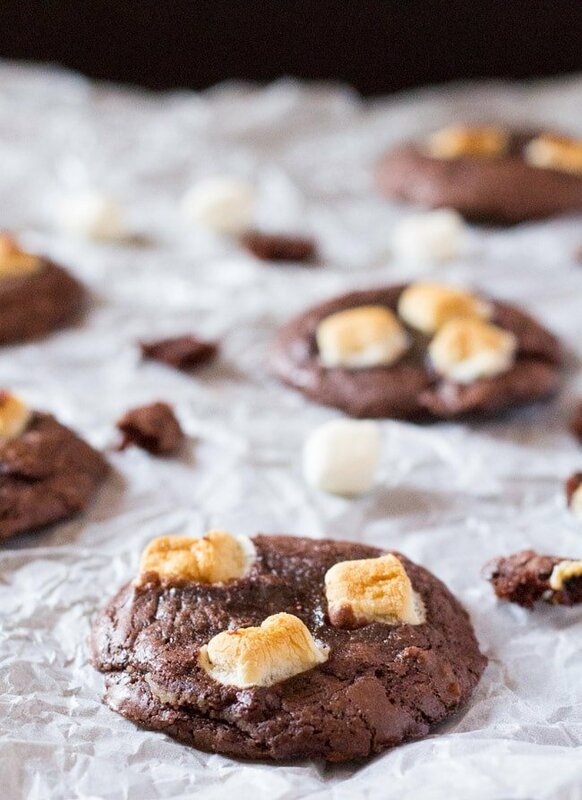 Ooooh, what if I top these Brownie Mix Cookies with mini marshmallows? 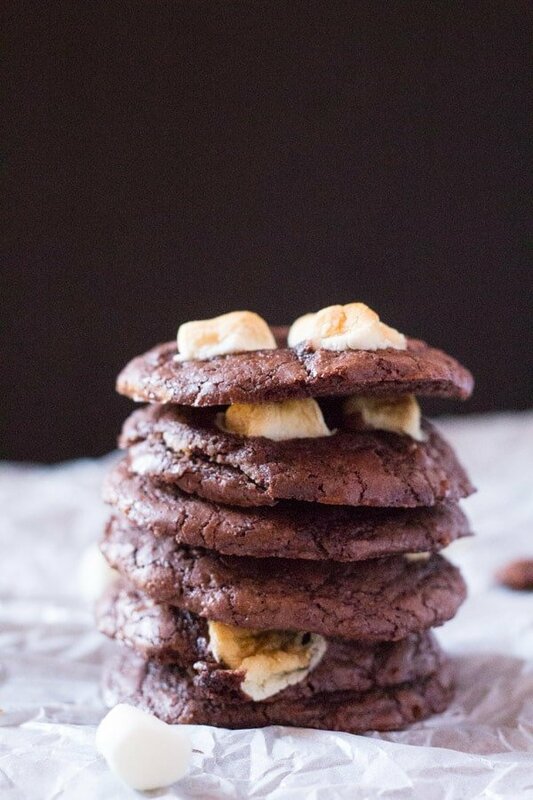 And let me tell you, I am proud of this addition because it kind of makes them S’mores Brownie Mix Cookies, but without the graham crackers obviously. Confession time: Okay, don’t be mad at me, but I actually don’t like graham crackers in the whole s’mores thing, okay? 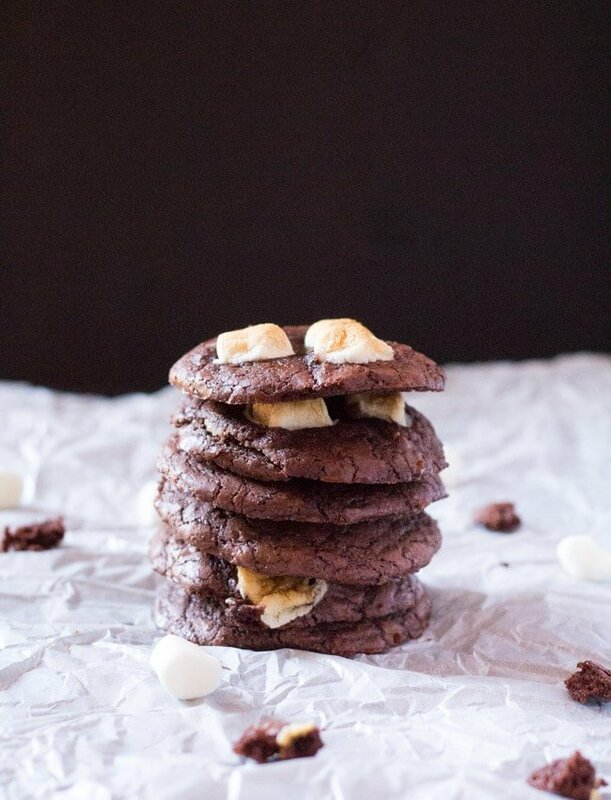 So while these cookies are super easy because the lazy cook in me, decided to use a brownie mix, there are a few tips I’ve outlined below to make your Brownie Mix Cookie experience go smoothly and perfectly. 1.) DON’T add the ingredients listed on the box of brownie mix. Just use the ingredients I’ve listed in the recipe card below. 3.) DO top with mini marshmallows. I used mini marshmallows to top the cookies, but you can use regular sized marshmallows. Just be sure to cut them into smaller pieces. Also, I tried adding more than 3 or 4 mini marshmallows but the best number for me was 2-3 mini marshmallows. NOTE: the mini marshmallows will deflate awhile after the cookies have been baked, but will taste just as delicious. 4.) DON’T over bake these please. I baked mine for about 9 minutes and they still looked pretty under baked when I removed the cookies from the oven. But don’t worry the cookies will continue cooking from the heat of the baking tray even after being taken out of the oven. 4.) DO: To get those nice, shiny, crackly tops on the brownie cookies, when you take the baking tray out of the oven, tap it lightly on the counter. This will help release the air from the cookies, and help form the cracky tops. 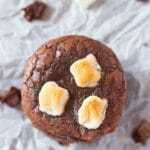 These Brownie Mix Cookies are so easy and delicious, and perfect for holiday baking and bake sales. These cookies are so simple, you can even bake them with your kids! Combine all ingredients (except the mini marshmallows) in a medium sized bowl. Beat with a handheld electric mixer until a smooth dough forms. Scoop dough into mounds (each mound should be about 2 tablespoons) onto the baking sheet. Slightly flatten each mound (but not completely) and top with 2-3 mini marshmallows. Bake for about 8-9 minutes. The cookies will look under done and not completely cooked through, but don't worry they will continue cooking on the baking sheet. To get the crackly tops on the cookies, lightly tap the baking sheet on the counter top when you remove it from the oven. Let cool on the baking sheet for about 3-4 minutes before removing from it.